Ladies and gentlemen, dear colleagues and friends, Not without reason I would like to give you some background information on the life and the work of an early German wind engineering pioneer, on Otto Heinrich Georg Flachsbart. Some of the results of Flachsbart=s work in the field of wind engineering are still used, even in modern Wind Codes like the Eurocode. You all remember the diagrams of drag coefficients for plane and spatial lattice structures with mem­bers of circular and / or sharp-edged cross sections. These diagrams are based on the early but precise wind tunnel experiments, Flachsbart performed in 1933. But before performing wind tunnel experiments, he should first be born. This happend 102 year ago, on the 26th of February 1898 in Paderborn - about 100 km away from here. After his school years, he studied in Hanover - only 200 km from here - you see, Bochum is in the very centre of wind engineering. In 1922 Flachsbart obtained his diploma his master degree in Engineering Sci­ences. For the next 2 years he worked for the German waterway administration. The treatment of fluid problems he worked with, may probably initiated his inter­est in fluid dynamics. So he went to Göttingen - about 300 km from here - and worked together with Prantl. After only 2 years he became head of a department at Prantl=s institute. He made his Ph.D. in Hanover in 1928 and became an associate professor in the field of Hydro- and Aerodynamics 3 years later. Only one year later the chair of Mechanics at the University of Hannover was offered to him. He accepted and the following time he started to lay the foundations of a mod­ern, physically based theory of wind forces. He built a wind tunnel, in which he performed - among a couple of other things - the already mentioned tests on drag coefficients of lattice girders. In 1937 we had the rise of power of the Nazis. One of their first acts was to rele­gate Flachsbart: his wife was Jewish. So he started to work as the head of the research department of a steel manufacturing company in Oberhausen, only 30 km from here.After the 2nd world war, in 1945, he was rehabilitated in his professorship of Me­chanics at the Hannover University. In the subsequent years, he became Dean of the faculty of structural mechanics, president of the University, Undersecretary of the Ministry of Science and Culture of the federal state of Lower Saxony. In 1953 the Karmarsch-Medal was awarded to him with the dedication: Ato the researcher, the teacher, the human, who testifies how technology, economy, science and arts can be connected in a creative spirit and an honest humanitari­anism@.Otto Flachsbart passed away in 1957 in an age of 59 years. I am sure you are wondering why I use this opportunity to familiarize you with some details of the life of Otto Flachsbart. The reason is that the Wind-Engineering-Society of Germany, Austria and Switzerland is now for the first time awarding the Flachsbart-Honorary-Medal for outstanding work in the field of wind engineering. This year the medal is awarded to a researcher, an engineer, a colleague who is really a cosmopolitan: He is born in India, grew up in South Africa, Bachelor and Master of Mechanical Sciences in Cambridge, England. In 1957, he received his M.Sc. in Civil Engineering from the University of Toronto, Canada before retur­ning to England to get his Ph.D. in Civil Engineering from the University of Bri­stol in 1961. Appointed to the Engineering Faculty of The University of Western Ontario at London, Ontario in 1961, he became Professor and Chairman of the Civil Engi­neering Group. He was the founder of the Boundary Layer Wind Tunnel Labora­tory and has been the Director since its establishment in 1965. His laboratory received early recognition and prominence for its research in wind engineering. As well as contributing to the scientific understanding, it has carried out innovative design studies for major structures, many of the tallest buildings and largest bridges in the world have been studied at Western. He is also active in wind and / or wave studies and atmospheric dispersion.In his research interests he has pioneered in the application of boundary layer wind tunnels to the design of wind sensitive structures, the description of urban wind climates and other problems involving the action of wind. He also has contributed to the fields of meteorology, environmental loads, structural dyna­mics and - may be in our community today not generally known - in earthquake loading. He developed the world's first statistically based seismic zoning map, for Canada. He has acted and he acts as a consultant engineer on many major structures, including the world's tallest and longest:: the World Trade Center in New York City, the Sears Building in Chicago, the CN Tower in Toronto and the proposed new 3,300 m free span Messina Straits Crossing in Italy, Normandy bridge in France, the Storebaelt bridge in Denmark and the Tsing Ma bridge in Hong Kong. He served and serves on a wide variety of professional and government commit­tees, and he is member of numerous International Societies and Associations. By the way, I can=t remember a conference concerning wind engineering prob­lems he didn't partizipate in.During a meeting of the Working Group No. 4: Masts, Towers and Chimneys of the IASS, I met him the first time, may be 20 years ago. We discussed problems of full scale measurements of wind actions and system response because we were just starting a big research project including extensive full scale measure­ments, and I remember up to now, his precise and experienced contributions.With great pleasure I also remember the very nice evening we spent at his house. Ladies and gentlemen, I am sure, that in the meantime everybody here is aware, that the person I spoke about must be Alan Garnett Davenport. Dear Alan, the Executive Council of the Wind-Engineering Society of Germany, Austria and Switzerland has decided unanimously to award the Otto Flachsbart-Honorary-Medal to you as the first recipient. Congratulations! The certificate is made out in German, so I have to translate:The Wind-Engineering-Society of Germany, Austria and Switzerland awards Alan Garnett Davenport the Otto. 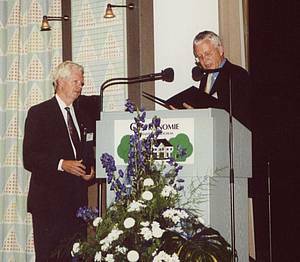 H. Flachsbart Medal for his pioneering, his trailblazing scientific work with which he laid the basis for the science of wind engineering and for the control of wind loads and responses.